When I was a programmer in IRIS, I always used to dream of starting my own technology firm. One of my very good friends always used to kid around that I would have to hire her as a CTO for my firm. The moment I would oblige her by saying, why not ... she would come to the topic of remuneration (smart one, yes she is). So one day I gave in and say magnanimously ... bol bachha, kya chahiye tumhe ... pat would come the answer ... a BMW. The answer would more or less have me confounded. Why a BMW? Of all the things ... BMW? Today I took a test drive in a BMW. Now I know why. Smart choice girl. The managing director of the firm for which I work (eYantra) was in the process of evaluating a BMW ... needless to say, most of the core team was invited for the evaluation. Why would I say no? 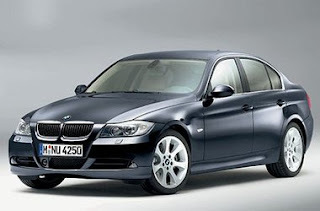 And on the D-Day, the car came ... a black shimmering sleek 320i BMW. A statement. A 35 lakh statement ... look I am here ... here, I am. The interiors were upholstered leather with wooden panelling. The entire car is packed with so many engineering marvels that its a small wonder its so small and sleek. Whilst I was raving to my friend Phani, he asked me a simple question ... would you put in 35L to buy a BMW?? might as well start a company of your own. WOW! Are there freelance openings for the driver of the BMW? ?